The final group of Old Testament books we're going to study contains the writings of the prophets. The people of Israel became a nation, God redeemed them from slavery in Egypt, and God brought them into their own land. They were given a law to live by, but they were constantly failing in their commitment to God. With idol worship, civil war, immorality and apathy, Israel needed to be recalled again and again to the purpose of their existence. The prophets were men raised up by God to call the people back to God. Warns of coming judgment against Judah because of their sins against God. Written during the later decline and fall of Judah. Tells of the coming judgment and urges surrender to Nebuchadnezzar. Jeremiah's lament over Babylon's destruction of Jerusalem. Warns first of Jerusalem's impending fall and then foretells her future restoration. The prophet Daniel was captured during the early siege of Judah and taken to Babylon. This book provides both historic and prophetic teaching important in understanding Bible prophecy. The chart below tells us when and to whom the prophets ministered. This particular section of lessons contains the books of the "major" prophets. I must stress again that the division between "major" and "minor" prophets only differentiates between the longer prophetic books [major] and the shorter books [minor]. KEY VERSE: 53:6 "All we like sheep have gone astray; we have turned  every one  to his own way; and the LORD has laid on him the iniquity of us all." LIFE AND MINISTRY PRINCIPLE: Rebellion leads to retribution [vengeance or punishment]. Repentance [deep sorrow and turning back to the Lord] leads to restoration. 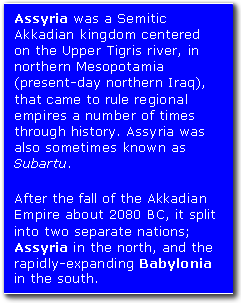 Chapters 36 through 39 were written during the historical transition from the Assyrian to the Babylonian period. The Bible has 66 books. Isaiah has 66 chapters. 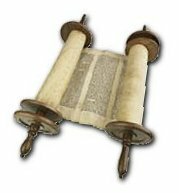 The Old Testament has 39 books covering the history and sin of Israel. The first section of Isaiah has 39 chapters on the same subject. The New Testament has 27 books describing the ministry of Jesus Christ and the Church. The last section of Isaiah has 27 chapters focusing on the Messiah. The New Testament begins with the ministry of John the Baptist. The second section of Isaiah begins with the prediction of his ministry. The New Testament ends by describing the new heavens and earth. Isaiah ends by describing the same things. It's the only Old Testament prophecy concerning the virgin birth of Jesus: Isaiah 7:14. It contains one of the clearest statements on the Trinity: 48:16. The most important chapter of the entire Old Testament, as it describes the Messiah's mission: chapter 53. Study the use of the word "salvation" in Isaiah. It appears 33 times in this book. What the book reveals about the character of God. What the book reveals of the ministry of Jesus. The Millennium reign of Jesus Christ. 33:3 "Call to me and I will answer you, and will tell you great and hidden things that you have not known." 1:7-8 "But the LORD said to me, 'Do not say, "I am only a youth"; for to all to whom I send you, you shall go, and whatever I command you, you shall speak. Do not be afraid of them, for I am with you to deliver you,' declares the LORD.'" LIFE AND MINISTRY PRINCIPLE: National disasters and deteriorations are often due to disobedience to God. Several object lessons are used by Jeremiah. An object lesson is when a visible object is used to illustrate or explain a spiritual truth. Study these object lessons in the book of Jeremiah in the chapters indicated. PURPOSE: To bring about repentance necessary for spiritual restoration and their eventual return to Israel. KEY VERSES: 3:22-23 "The steadfast love of the LORD never ceases; his mercies never come to an end; they are new every morning; great is your faithfulness." One of the greatest passages on the faithfulness of God is found in Lamentations 3:21-33. Read these verses and compare them with 2 Timothy 2:13. Compare Revelation 18 to the book of Lamentations. In Lamentations, the prophet weeps over the destruction of the Messianic city of Jerusalem. In Revelation 18, the merchants weep over the destruction of the materialistic city of Babylon. Read Lamentations 5:16. This verse summarizes the reasons for God's judgment. Around 1000 B.C. David established his capital in Jerusalem. God blessed this city for nearly 400 years and spared it even after He allowed the northern kingdom to be carried away by the Assyrians in 721 B.C. All of His mercy was in vain, however, for the people of Judah continued to sin. Judgment now came. The Jews have for centuries publicly read Lamentations each year on the ninth month of Ab to commemorate the destruction of the first temple in 586 B.C. and of the second temple in A.D. 70. It is said that Jeremiah sat weeping outside the north wall of Jerusalem under a hill called Golgotha where Christ would later die. Jerusalem is personified [represented] as a woman. List what happened to Jerusalem and why. Note her emotions, the anguish because of her children, and the thoughts and memories she must deal with. Record what you learn about God in this book: His character, His judgments, and why He acts as He does. For example, Lamentations 1:5 states that God caused Judah grief because of her sin and brought about her captivity because of her transgressions. Why do you think God deals with sin as He does? How should we respond? Read chapter 3 so your "dancing" may appropriately be turned into "mourning." KEY VERSE: 22:30 "And I sought for a man among them who should build up the wall and stand in the breach before me for the land, that I should not destroy it, but I found none." LIFE AND MINISTRY PRINCIPLE: The Lord controls historical events so that the nations will know He is God. Six years before the destruction of Jerusalem, Ezekiel began his prophecies of warning to Judah. These prophecies were directed at Judah's enemies. 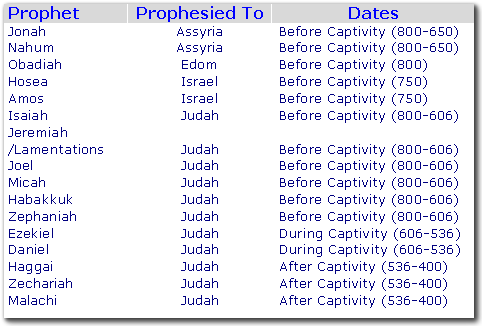 These prophecies concerned the restoration of Judah. Compare Ezekiel chapter 16 and the book of Hosea. The most vivid Old Testament vision is the valley of dry bones found in Ezekiel 37. Study this chapter. The tabernacle of Moses: Exodus 40 representing the Temple of Christ's body in John 2. The temple of Solomon: 1 Kings 6 representing the spiritual temple of the Church in Acts 2. It is important to realize that God directs/controls the events of history with one purpose in mind  that the nations might know that He alone is the true God. The phrase "they shall know I am the LORD [YHWH / Yahweh / Jehovah]" occurs 70 times in Ezekiel. Underline these passages as you study Ezekiel to help you understand the divine purpose of God's actions. Chapters 20-23 include several parables. One of the most important ones is that of the two sisters, Aholah and Aholibah. They represent Israel and Judah's deterioration into idolatry. KEY VERSE: 12:3 "And those who are wise shall shine like the brightness of the sky above; and those who turn many to righteousness, like the stars forever and ever." 7 weeks, or 49 years, began at the command to build Jerusalem under Ezra and Nehemiah. 62 weeks, or 434 years, began at the building of the wall of Jerusalem and continued to the time of the crucifixion when the Messiah ["Chosen Leader" in the CEV, "Messiah" in the KJV, and "anointed one" in the ESV and NIV] was "cut off". The second part of verse 26 foretells the destruction of Jerusalem and the temple that actually took place in 50 A.D.
And finally, the 70th week are 7 years that have not yet begun. This starts when the Antichrist takes power and the tribulation begins. This ushers in the time of trouble described in Daniel 12:1 that is referred to as the "Great Tribulation" in Revelation. 1The Voice: Biblical and Theological Resources for Growing Christians  "Old Testament History: The Rise of Babylon and Exile (640 BC-538 BC)"